And my response is that it depends on your situation, such as where you live, whether your source water is tap water or well water, whether you rent or own, and how much you are willing to invest. There are several types of drinking water filters to consider, including under sink water filters, counter top water filters, faucet water filters, as well as water filter pitchers and dispensers. So I will highlight our top recommended drinking water filter in each category. The main advantages of under sink filters is that they do not take up counter top space, they offer a high degree of filtration, and the filters last two to three times longer than most of the other drinking water filters. These types of filters require professional installation and are usually not allowed if you are renting. Our top recommended under sink water filter is the Aquasana 3-Stage Claryum Under Counter system. This system is certified to NSF/ANSI standards 42, 53 and 401. Counter top water systems also provide a high level of filtration. They do not require professional installation, and they are portable. They are also less expensive than under sink systems but they do take up some counter space. Our top recommendation for the counter top system is the Aquasana Counter Top Water Filter. This system is certified to NSF/ANSI standards 42 and 53. 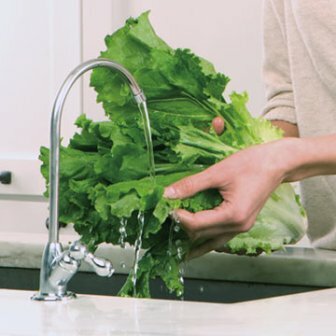 Faucet water filters do not provide the same degree of filtration as the under sink and countertop systems, but they are easy to attach to the faucet, provide moderate levels of filtration and they are fairly inexpensive. Our top recommendation is the PUR Faucet Water Filter (3-stage FM-9400). This system has the highest ratings for filtration compared to other faucet filters. It is NSF certified to filter out up to 30 water contaminants. A water filter pitcher is the most portable water filter. The best drinking water filter pitcher in our reviews is the BPA-free Crystal Quest Pitcher Water Filter. It has a much higher level of filtration (4 stages of filtration) and is certified to NSF/ANSI standards 42 and 61. A water filter dispenser will hold anywhere from 1 gallon to 8 gallons of water. Water dispensers are portable and can be used with most tap water and well water. The Berkey system is our top recommendation for water filter dispensers because of their degree of filtration, reliability, and long-lasting filters. There are several different Berkey water filter systems that offer water storage from 1.5 gallons (the Travel Berkey) to 6 gallons (the Crown Berkey). Since these dispensers can also be used with potable water, they are a good choice for travelers and campers.